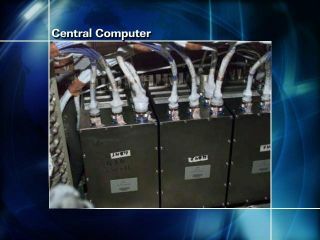 This image shows a view of the central computer aboard the International Space Station, one of several Russian systems experience issues during NASA's STS-117 mission. HOUSTON -- Astronautsaboard the International Space Station (ISS) will physically unplug a pair ofcables feeding power from new solar arrays to the outpost?s Russian segment late Thursdayin hopes that it might aid the recovery of critical computer systems, missionmanagers said. ?Theleading theory today is, we?ve introduced some noise at a level that, now, thesecomputers are tripping themselves off,? NASA ISS program manager MikeSuffredini said. TheGerman-built computers used in the station?s Russian segment are known to besusceptible radiant or conductive ?noise? in power feeds, which led ISSengineers to suspect that a similar phenomenon may be at work in cables ferryingpower from the station?snew solar arrays at the tip of the Starboard 4 power truss installedearlier this week. ?? ?It seemsthat shortly after we made those connections our Russian colleagues startedhaving problems,? Suffredini said, adding that, if proven, it would hint atsome anomaly in the new solar wings. ?The power source coming from the solararrays that have been on orbit has been very clean, if you will. We?ve beenwell within our power quality specs.? The theoryis by no means final, but will be tested along with others to determine exactlywhat prompted amajor shutdown of the station?s Russian computer systems Wednesday. Theshutdown left the ISS dependent on U.S. attitude control systems and thrustersaboard the visiting Atlantis shuttle. NASAofficials expect the troubleshooting efforts torun several days, and hope to recovery the computer systems before Atlantisleaves the ISS on June 19. ?We dothese things one step at a time,? Suffredini said. ?We try not to shotgun thesefixes.? To test thepossible fix, astronauts will open up access panels in the station?s Unitynode, then manually disconnect cables that feed S4 solar array power intoconverters that, in turn, route it into the Russian modules. The modules willrely on a previous power configuration to draw electricity generated by solararrays at the portside end of the ISS, Suffredini said. ?This soundslike a good plan,? said Atlantis mission specialist Sunita Wiliams, who until recentlyserved as an ISS crewmember, after Mission Control relayed it to the stationcrew today. ?We?re looking forward to trying to get these computers backonline.? Some of thestation?s Expedition 15 crew will have to wake up overnight to aid Russian flightcontrollers in troubleshooting the computer glitch. The work has affected the crew?ssleep schedule since it can only be done when the ISS passes over Russian groundstations early in the day, NASA said. Meanwhile,Atlantis shuttle astronauts spent much of today preparing for a Fridayspacewalk and continuing efforts to furl an old solar array reaching out tostarboard from the space station?s mast-like Port 6 (P6) truss. Atlantis?STS-117 mission specialists Jim Reilly II and Danny Olivas will step outsidethe ISS Friday to repaira torn heat shield blanket on the orbiter?s aft, install a vent valve for anew ISS oxygen system and help coax a stubbornsolar array into its storage boxes atop the space station?s mast-like Port6 truss. Efforts toretract the solar array, which was partly furled during a Wednesday spacewalk, metsome additional success today as astronauts remotely guided a few more sectionsinto storage boxes. About half of the array?s 115-foot (35-meter) lengthremains to be packed away during Friday?s spacewalk. ?That?sgood news,? said NASA astronaut Megan McArthur, serving as spacecraftcommunicator in Mission Control. ?We?re halfway there.? NASA isbroadcasting the space shuttle Atlantis' STS-117 mission live on NASA TV. Click here for mission updates andSPACE.com's video feed.